Calle and I lectured all over Sweden about our experiences. In response to audience reactions, we wrote a book in Swedish about the voyage. Our story, however, is bigger and deserves a bigger audience. This is why I’ve brought in a talented writer, Tracey Christiansen, to help retell our story in English. Anders Nyman from Brunmedia has helped us with the layout to get the book ready to print. Thanks to all the hard work of Tracey and Anders the finished product is now ready. The result is Brave or Stupid, a book for anyone who has ever had a dream, anyone who has ever gone beyond what is sensible and realistic to discover a whole new world outside and a whole new person inside. The book is full of photos and illustrations from a journey that is everything you would expect and much you wouldn’t. Was born and raised in Helsingborg, Sweden, across the water from Elsinore and Hamlet’s Castle. Yet, he rarely made the 20 minute ferry crossing due to seasickness. Yanne is a strong believer in the power of dreams and his perseverance has taken him on a rollercoaster ride from electrician to businessman to world sailor and back. 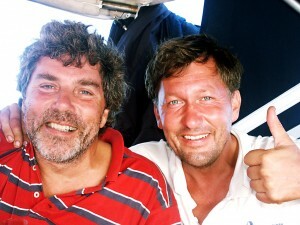 In 2002, he left Helsingborg to sail around the world with his best friend Calle Andersson, who, like him, originally had no sailing experience. He has been through three marriages, and started his fourth career. These days you will find Yanne at the beautiful Bed and Breakfast place, Rue Galilee, with a top notch restaurant in Marseillan, south of France. Check out Rue Galilee and come talk some circumnavigation sailing in person. Born in Eslöv, Sweden, Calle started as an electrician, but his talent for mathematics soon took him to higher studies in electrical engineering. He eventually worked his way up to Managing Director of Peab’s electrical division. Since then he has had a long career of management positions at major energy companies. For better or worse, Calle is known for being 100% honest and 150% stubborn. After travelling the globe for 25 years, British born Tracey Christiansen settled in Sweden with a Danish husband. Having unpacked the boxes from her numerous sojourns and hung the curtains, she decided to concentrate on writing full-time. To date, she’s translated and published numerous articles and short stories for a variety of publications and was just putting the finishing touches to her first novel when Yanne and Carl asked her to write their story in English. After being plied with copious glasses of wine, it seems she agreed. When not being a run-off-her-feet mother, chauffeur of two girls, caretaker to one cat and mostly uncomplaining wife, she enjoys reading, napping on the sofa and embarrassing her teenage daughters by dancing in public.